Where the gears of time do not always wind forward. The crossroads of time and space. Tinker with the wizards of yesteryear. Rest neatly in the palm of your hand. We invite you to turn the brass knob. To peer into the pockets of time, space, and curiosity. Jagmin is a self-proclaimed (not-very discriminating) collector of images– images he finds amidst the clutter and noise of our digital world. We are continuously bombarded by visual explosions, sound bites, advertisements, and talking points that excite and stimulate our senses. These messages clatter and clang around us, constantly shifting. What at first seems important and interesting, however, can soon leave us feeling vulnerable, confused, and uninformed. Jagmin makes sense of these extremes by seeking out the visual pieces that resonate with him, deconstructing them, and then reconstructing them to reveal freeze-framed moments in time. His pieces become stories in their own right. By combining fragmented bits of iconic images and symbols, historical and current events, graphic patterns, and advertising marks, Jagmin creates art that visualizes what it means to live in the moment. His artwork speaks to the world of today– highlighting the darkness with the light. These personal, messy epiphanies are packed with memories, history, triumph, sadness, color, beauty, decay, energy, humor, and urgency. Jagmin has taken the often-overwhelming chaos that surrounds the day-to-day and has edited it down to reveal new insights of our world. 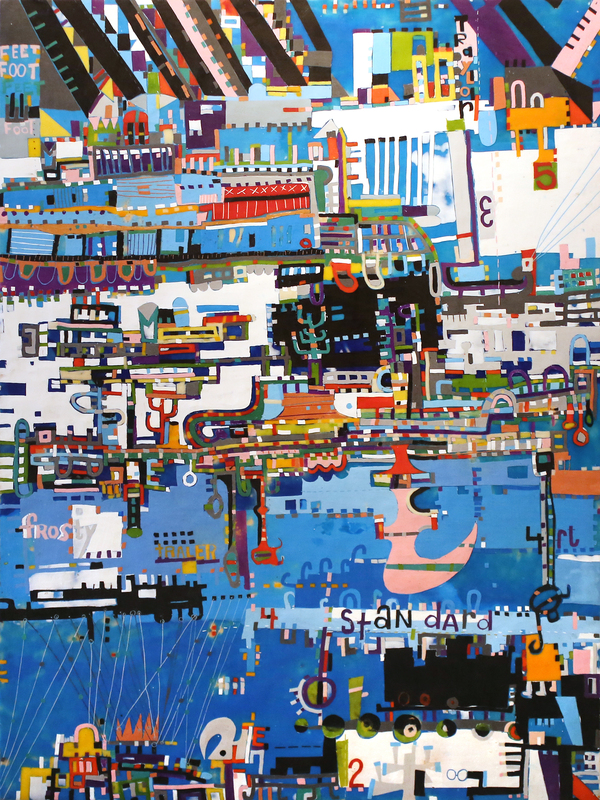 Jagmin would like every viewer of his work to similarly deconstruct the meaning and apply his images to their own reality. Visit Practical Art Friday night and come to your own conclusions about each unique masterpiece, or take one home for yourself. August Charity Pie Night benefiting Area Agency on Aging! Fireball Apple, Mexican Chocolate, Ginger Peach, OH MY! There’s no place like Practical Art—especially tomorrow night, when you can come support our favorite monthly tradition, Charity Pie Night. Sample delicious desserts, peruse one-of-a-kind artwork, and give back to this month’s local non-profit, The Area Agency on Aging. Our favorite pie-maker, Karen Olson (of Vonceil’s Pies), is pulling out her apron and whipping up a few of her famous delectables—all to support the work of this vital agency! It’s an unfortunate truth that senior citizens and individuals struggling with disabilities are often forced to leave their homes and enter assisted living facilities. The inability to drive, the strain of keeping up a home, or the lack of companionship can become obstacles that prevent successful independent living. The Area Agency on Aging strives to combat these obstacles and allow individuals who want to stay in their homes the ability to do so. Through Meals on Wheels, in-home nursing, housekeeping services, and other important programs, the Area Agency on Aging gives senior citizens, and those struggling to overcome disabilities, the tools to remain in their own homes. The donations from tomorrow night’s Charity Pie Night will go towards the Area Agency ‘s annual campaign, ‘Lift the Wait.’ This campaign raises money to help get clients off of the wait list and started on services, like Meals on Wheels. Government budget cuts starting in 2012, greatly impacted the amount of services and clients that the Area Agency was able to serve. This campaign helps bridge the gap and expands the goods and services provided. Every dollar raised has a huge impact for an individual in need! Friday night is your opportunity to give back—and eat pie! Donate $5 and enjoy a single slice of the pie of your choice, donate $10 and receive an unlimited sampling of the different flavors available! We will also donate 10% of sales that day. Your purchase will support not only the Area Agency on aging, but also our 130 local artist. Take home your very own piece of ‘Practical Art’! *Gluten free and Vegan pie options are plentiful! Posted on August 27, 2015 Categories UncategorizedTags Area Agency on Aging, artist, charity pie night, local art, local artists, phoenix, Phoenix Art, pie, pie social, Practical Art, shop local, Vonceils piesLeave a comment on August Charity Pie Night benefiting Area Agency on Aging!